Whether you’re celebrating a successful quarter or planning to motivate your team or wanting team members to spend time together outside of the office, we have the walk for you. The corporate walks can be personalized to meet your requirements and shortened if time is an issue. 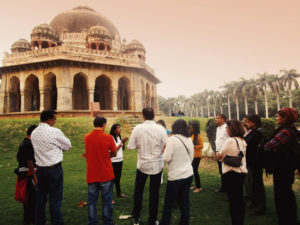 We regularly organise walks for corporate groups, providing a memorable way for attendees to get to know India and each other. Whether you want us to completely arrange a full day walk or a time saving half day walk, cultural experience or a time out from busy and hectic schedule, we can deliver private, group and special interest walks for corporate making your visit an unforgettable beautiful memory.